BOTD "pumped" the MARCH 55s with $RIG above $60. "plan your work, work your plan." p.s. Catch the RECOs Semi-Real-time on StockTwits.com , ... halla! holding BAC calls, and IYR calls as our BULL hedges. also if JWN and M pop in the AM , it should help our IYR calls , by default. malls are commercial real estate, and for the love of children and shopping!, it would be nice to have Macys and Nordstroms still in business. right? ohh and our GS short was money! from $84+ to under $80 ... shazzzamboni! IYR calls ... VNO reports in the AM. also watch FWLT's earnings tomorrow. Hey you need to post more coherently, you are incoherent now so general public can understand what you have done/ planning to do. You want folks to understand your brilliance make it possible. Take that RIG put option play of yours. 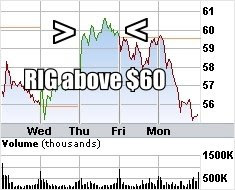 I assume you bought and sold on the same date March $55 puts on Thursday when RIG was >60 for something around $1.9 a put. On Friday the stock dropped $2, and your puts went up temporarily to 2.70. So you sold them for $0.7 gain minus the commision both ways. Did I get it right above? If so why didn't you wait till Monday when your puts went up another 0.8 to $3.50? Would double your profit. DO you expect the market to rally today? Do you think shorting FAZ is a good idea? BOTD - what level of stock price do you target on NEM? I started my SRS positions at average of $70 now. 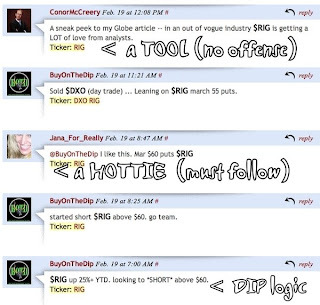 we added the march 55s with RIG above $60, we gave our logic and buy target for the puts. saying that RIG up 25% YTD we wanted to add puts above $60. we did. 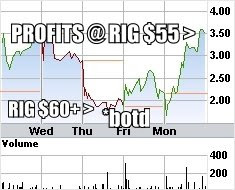 then we sold MONDAY when rig hit $55. BIG WINNNNER! .... sorry about our randomness and humor. i understand my "verbiage" can be a bit tough to decipher. we'll try to make our RECO's more obvious going forward. lets just ride NEM down with gold.